SPARK INSIGHT: Windshield Washer Fluid at an Unbelievable Price! Windshield Washer Fluid at an Unbelievable Price! You save money at Costco by buying in bulk. Here's an example. 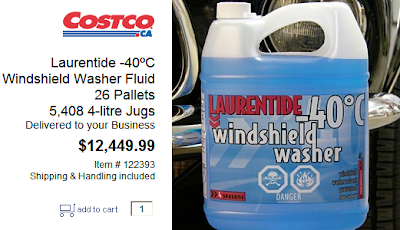 Costco.ca has Laurentide Windshield Washer Fluid good to -40C for $12,449.99. Correct ---- less than $12,500. Naturally, delivery is included. You don't see prices like this every day. That's only $2.30 per 4-litre jug and you get 5,408 jugs. de-icing: BMW recommends de-icer instead of a scraper to clean ice and snow off car windows, but have you seen their prices? What other uses come to your mind? Add them as comments to this post. But first place your order. Here's the link. Windshield Washer Fluid is toxic to animals. Please do not pour it on the yellow snow. It will kill the next dog that sniffs at that spot. That's good to know. Thanks for the tip.